Namibian President Hage Geingob and Chinese Prime Minister Xi jinping (file photo). WINDHOEK - Namibia and China are expected to sign a cooperation deal under the Belt and Road Initiative during President Hage Geingob's visit at the upcoming China-Africa Cooperation (FOCAC) Beijing Summit slated for September 2 to 4, as Beijing seeks to cement its strategic influence in Africa. 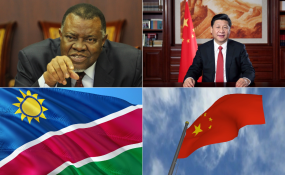 Geingob and delegation are expected to leave for Beijing on September 1. Briefing Geingob at State House yesterday on the official programme for his state visit to Beijing for the FOCAC Summit, Chinese Ambassador to Namibia Zhang Yiming urged Namibia to take advantage of the China-proposed Belt and Road Initiative for her own development. In addition to cooperation pacts on road and rail infrastructure, the two sides are expected to sign two more deals ranging from tourism to visa exemptions for diplomatic and service passport holders. Proposed by China in 2013, the Belt and Road Initiative refers to the Silk Road Economic Belt and the 21st Century Maritime Silk Road. It is aimed at achieving policy, infrastructure, trade, financial and people-to-people connectivity, building a new platform for international cooperation, and creating new drivers of shared development to benefit more countries and people. If Namibia signs the Belt and Road agreement, it will become the 10th African country to seal the deal. The Belt and Road project is seen to positively impact on Africa because currently China-Africa Trade has grown from US$10 billion (in 2000) to US$239 billion (currently), and China has become Africa's largest trading partner. So far, the Belt and Road Initiative projects on the African continent largely only cover East Africa. He however could not shed the exact amount of money needed in the realisation of the project. "This forms part of the comprehensive strategic partnership between the two countries. We decided to offer our assistance. What I can tell you is that through the modalities, this is part a loan grant plus the Namibian government concession loans. I cannot tell how much makes up the grant but it is a genuine support from China. Once we finalise details then we will reveal it to the media," he told journalists. Zhang said at the moment, they are busy with discussions with the line ministries, saying they received positive feedback thus far. Geingob who welcome the initiative could also not shed more light saying the Finance Minister Calle Schlettwein would soon inform the public on any progress made. "I said business deals must start with the line ministries. I would like to thank you that you stayed away from me. It is the first I heard about the agreement. I even called the Minister of Finance to question why he never told me about the agreement. He wrote me a letter to submit the agreement two days ago. Then I called him... he can tell you I was very angry with him [laughingly]. He should brief me on overall progress made since overall framework was there that we agreed on. I went ahead to accept and put my conditions to be negotiated. But I forgave him," Geingob said. Geingob called those involved in any agreements to be transparent at all times, as chances of corruption are slim. Zhang emphasised that Namibia should tap into funding from China based on this initiative to develop its own infrastructure to enhance intra-continental trade. At the Summit, the ambassador revealed Chinese President Xi Jinping is expected to meet 50 heads of states and representatives of government to speak on China-Africa friendship, plans for the development of the strategy, opening the new era of China-Africa win-win cooperation and mutual growth. China and countries participating in the Belt and Road Initiative inked trade deals worth US$389.1 billion in the first four months, the Chinese Ministry of Commerce said earlier. It represented a growth of 19.2 percent year on year. China's non-financial investment in those countries increased 17.3 percent from the same period a year ago to US$4.67 billion. Business volume of outbound contract projects came in at US$24.2 billion, up 27.7 percent year on year. By the end of April, China had built 75 economic and trade cooperation zones along the Belt and Road countries with accumulated investment of US$25.5 billion. More than 3,800 companies have joined the cooperation zones, paying nearly US$1.7 billion in tax revenue and generating nearly 220,000 jobs. A local newspaper quoted ambassador Zhang as bemoaning the fact that Namibia is at risk of being left behind if it does not fully embrace Chinese economic assistance. He said African countries such as Ethiopia and Kenya have benefitted tremendously from Chinese economic assistance. Zhang also urged Namibia to fast track a social housing deal clinched during Geingob's state visit to China in March this year. In terms of that agreement, China pledged N$30 million in grants and N$36 million in no-interest loans, equally split between Gobabis and Grootfontein that have acute housing shortages.